Inadequate Stair Surfaces. Stair surfaces should provide firm footing and adequate slip resistance so as not to contribute to slipping or tripping. Surface materials such as carpet with distinct patterns can obscure the leading edges of the treads and contribute to a misstep. Projecting Leading Edges. The nosings on stairs with short treads can present a trip hazard to people descending the stairs since the effective width of the tread is reduced and heels may catch on the nosings. Nosings may also present a trip hazard to people ascending the stairs if the person’s foot is dragged up the riser, the users toe may catch on the nosing and result in a misstep. Distance between Landings. Reducing or limiting the distance between landings provides for more resting places and reduces the distance one might fall. Unsafe Handrails. The space between handrails, their strength of fasteners, height, ability to grasp, handrail continuity, extensions beyond the top and bottom risers, and visibility all affect safety. Inadequate Lighting. Uniform light levels over the whole stair and low glare light sources improve visibility and reduce the likelihood of missteps. Distractions. 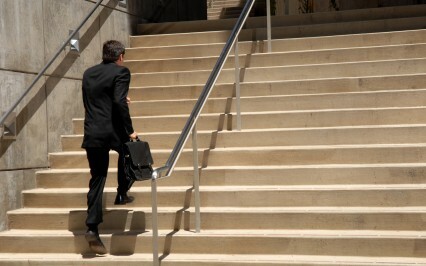 Stair accidents also occur when the user’s attention is distracted by a change in view. Victim Fault. Insurance companies and their lawyers will always attempt to blame the victim for these falls. Any physical disability of the victim will be examined as a possible cause. Did the person have any perception or sensory difficulties? The insurance company will examine the victim’s footwear, high heels or long skirts that could have been a stumbling hazard. If the victim was carry large heavy items or rushing, these factors will be used to blame the victim.